World of Pinot Noir Moves to Santa Barbara The World of Pinot Noir event (WOPN or “whoppin”) will be celebrated beginning in 2014 at the Bacara Resort & Spa in Santa Barbara, one of the finest hotels in the world. The fourteenth annual WOPN will take place February 28 and March 1, 2014. Over 100 wineries will participate, and the event will include a Gala Dinner, the popular Burgundy seminar and tasting, and a featured winery dinner in the Miro Restaurant Wine Cellar. Visitors to the event are encouraged to extend their visit to the Central Coast and explore the many wineries in the area. Additional tours, seminars and packages are being offered by local associations. 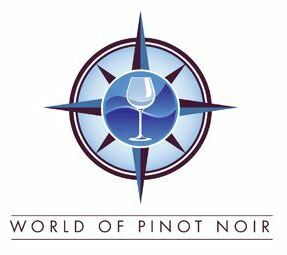 World of Pinot Noir VIP ticket packages have already gone on sale at www.wopn.com/store.html and individual event tickets will be available in the early fall. Bacara Resort & Spa is offering lodging deals at www.wopn.com/travel/bacararates.html. Proposed Eagle Peak Mendocino County AVA According to www.norcalwine.com (June 27, 2013), the Alcohol and Tobacco Tax and Trade opened three AVA actions for comment. One is the proposed Eagle Creek Mendocino County AVA and the other two proposals would decrease acreage in Mendocino and Redwood Valley AVAs. The three proposals are related because the suggested Eagle Peak Mendocino County AVA overlaps both Mendocino and Redwood Valley AVAs. 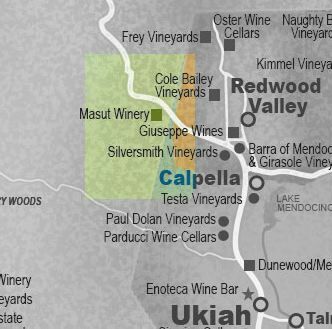 The new Eagle Peak Mendocino County AVA would be about 26,260 acres and includes 16 vineyards comprising 120 acres total. The new alignment would place Masut Vineyards, a prominent Pinot Noir producer, solely within Eagle Peak Mendocino County. The name Eagle Peak is taken for a 2,699 foot summit in the region. Eagle Peak Mendocino County ranges from 1,100 to 3,320 feet with steeply sloping terrain with southern exposures. Adjacent Redwood Valley and Ukiah Valley are mostly lower and generally flat. Eagle Peak Mendocino County is significantly cooler than either Redwood Valley or Ukiah Valley with more wind. Soils are shallow and well-draining on Fransican Complex sandstone and shale. 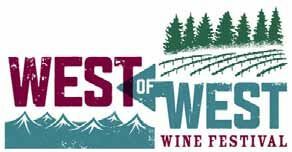 West of West Wine Festival Join me at this year’s West of West (WOW) event to be held at The Barlow in Sebastopol, August 2-4. Welcome dinners Friday night, August 2, seminars followed by a Grand Tasting on Saturday, August 3, and vintner interviews, vineyard tours and lunch followed by a second Grand Tasting on Sunday, August 4. Tickets are available at www.westsonomacoast.com. Sonoma County Wine Country Weekend Held August 30-September 1 (Labor Day Weekend) at various locations, the event includes winemaker dinners, cooking demonstrations, wine seminars and a large tasting at MacMurray Ranch in Healdsburg. For information, visit www.sonomawinecountryweekend.com. Wine and Fire Celebration Join me at the Wine and Fire Weekend Celebration, August 16-18, sponsored by the Sta. 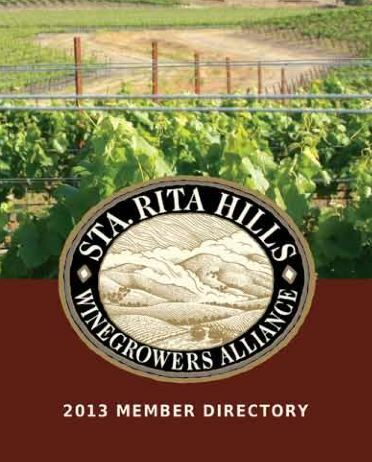 Rita Hills Winegrowers Alliance. The event kicks off with a Friday Night Barn Party at Sanford & Benedict Vineyard. Saturday morning seminars and lunch are followed by a Saturday evening Grand Tasting at La Purisima Mission. Tickets are on sale at www.staritahills.eventbrite.com. The 2013 Wineries and Vineyards of the Sta. Rita Hills AVA brochure is available at www.staritahills.com/touringmap.pdf. Keep the Promise Wine Tasting Benefit The Seventh Annual Keep the Promise event will be held in Newport Beach, CA, on Thursday, September 26. Attendees can drink exceptionally rare wines from all over the world and support one of Orange County’s art-based, low-income youth development organizations, The Wooden Floor. All fourteen featured red and white wines were generously collected and donated by Newport Beach residents Janice and John Marklay and all have received ratings of at least 94 points by the Wine Advocate and/or Wine Spectator. Last year’s even raised over $200,000 for The Wooden Floor. For more information, visit www.thewoodenfloor.org/events/. Thomas George Estates Dinner in the Cave A special dinner will be held July 27 at Thomas George Estates in the Russian River Valley, featuring Japanese cuisine from Los Angeles’ famed Katana chef Koji Matsuzaki. The 6-course dinner will include 2010 Starr Ridge Vineyard Sparkling Pinot Noir, 2010 Catie’s Corner Vineyard Viognier, 2010 Cresta Ridge Chardonnay 2010 Baker Ridge Vineyard Pinot Noir, 2010 Cresta Ridge Vineyard Pinot NOir, 2010 Starr Ridge Vineyard Pinot Noir, and 2010 Late Harvest Windsor Oaks Muscat Canelli, all Russian River Valley bottlings. Tickets are $140 per person and must be reserved by July 22 by calling 707-431-8031 or emailing nancy@thomasgeorgeestates.com. Feast Portland & The Bite of Oregon Feast Portland offers the opportunity to join a who’s who of the country’s best chefs at this four-day event held September 19-22 in one of America’s greatest foodie cities. Wine dinners on Thursday, September 19 feature Adelsheim Vineyard, Boedecker Cellars, Sokol Blosser, Willamette Valley Vineyards and King Estate Winery. Pinot lovers will want to attend the “Clash of the Pinots: Oregon vs the World,” tasting, and “Oregon Bounty Grand Tasting,” both on Friday September 20. Net proceeds go to worthy charities working to end hunger in Oregon and around the country. For information and tickets, visit www.feastportland.com. The Bite of Oregon, celebrating 30 years, is Oregon’s largest culinary event. Held August 9-11 at Portland’s Waterfront Park, the event includes cuisine from Oregon’s top chefs, drinks from Oregon’s finest wineries and craft breweries, celebrity chef demonstrations, live bands and entertainment, and children’s activities. Pinot Noir producers that are participating include Capitello Wines, Namaste Vineyards, Seufert Winery, and Willamette Valley Vineyards. For information and tickets visit www.BiteofOregon.com. Elk Cove’s “Memphis Goes Hog Wild in Oregon” On August 17, Elk Cove Winery in Gaston will host noted Memphis chefs Andy Ticer/Mike Hudman of Andrew Michael’s/Hog & Hominy, Felicia Willett of Felicia Suzanne’s, Craig Blondis of Central BBQ and Ryan Trim of Sweet Grass/Next Door/Southward. Big bottle bar, Rosé smackdown and Bluegrass band. Tickets are $75 and available by calling 1-877-ELK-COVE. Carlton’s Walk in the Park Saturday, August 17 and Sunday, August 18 in Carlton, Oregon. A benefit for local charities that combines artists and musicians with local restaurants and wineries. Garden art, nursery plants and a classic car show add to the festivities, held at Wennerberg Park in Carlton. Enter the raffle for a chance to wine the 1st Prize of a 100-bottle Instant Wine Cellar featured Oregon wines. For tickets and raffle tickets, visit www.CarltonWalkinthePark.com. ¡Salud! Benefit Concert On Sunday, August 11, an evening concert and picnic will be held at Penner- Ash Wine Cellars . Award-winning chef Vitaly Paley will be paired with Penner-Ash wines. Guests will cozy up on a blanket in the lush oak grove to enjoy the acoustic concert of headlining singer-songwriter Lori McKenna with Portland native Stephanie Schneiderman opening. 100% of ticket sales benefit ¡Salud!. Tickets are $100 and may be purchased online at www.tualityhealth.ejoinme.org/benefitconcert. Fourth Friday Nights in Carlton Jean Driscoll of the Carlton Business Association told me of a program for locals that is being offered this summer. The businesses of Carlton, Oregon, will stay open late until 7pm on the fourth Friday of the month when they will provide special offerings and pricing on Willamette Valley food, wines and crafts. The remaining dates are July 26, August 23 and September 27. Movie ‘Somm’ A documentary about the extraordinary effort required to obtain a master sommelier certification. The film, which is currently playing in small theaters, follows four people who prepare to take the exam that very few people pass (less than 200 in the past 40 years). The documentary is written and directed by Jason Wise, whose friend, Brian McClintic, is one of those studying to take the exam. Their tortuous experience from three weeks before the exam through the competition is featured. Reviews have been generally very positive. Wines of Danger A cadre of professional winemakers who produce small batches of very personal wines. Some of the winemakers have day jobs working for established wine brands and some do this full time. Either way, they make wines that are anything but save. Their tagline is, “There are safe wines and there are wines of danger. We prefer the latter.” A media and trade tasting is scheduled for August 12 at the Press Club in San Francisco (passes available on the website). There are currently fifteen members, some of which have had wines reviewed in the PinotFile, including Coterie Cellars, Waxwing and Pelerin. For more information, visit www.winesofdanger.com. Pinot’s Palette This is a fast-growing national franchise where guests can paint and drink wine. Franchise partner studios are already open or scheduled to open in Arkansas, California, Colorado, Florida, Kentucky, Massachusetts, Oklahoma, and Texas. In March, Pinot’s Palette was the only paint and sip franchise included on Entrepreneur Magazines “Top New Franchises.” Guests can bring a bottle of their favorite wine (alcohol regulations vary by location) and local artists guide them step-by-step through a featured painting, allowing them to end the evening with their own masterpiece. Visit www.pinotspalate.com. Winery Passport App The Winery Passport App was recently launched in the Apple App Store. The App connects you to wineries, allows you to stamp your passport with each visit, then record detail of your visit including your favorite wines and ratings. The App also connects with Facebook and Twitter friends so you can share your journal companions. The Winery Passport App is available for the iPhone and iPod Touch and is free. For further details, visit www.WineryPassportApp.com. You can download the App in iTunes through this link: www.WineryPassportApp.com/download. Vine on Twitter Vine sounds like it is wine related, but it is an innovation in social media that many are not aware of. Mercedes Ann Bell recently sent me a copy of an article she wrote for a site dedicated to online education: www.onlineuniversities.com/blog/2013/04/vine-education/. Twitter’s newest service is a videosharing App called Vine. This mobile App allows users to create and share very short (not to exceed six seconds in length) video clips. It was launched as a free App on iPhone and iPod Touch in January 2013. Mercedes lists a number of applications of this tool in education and is certain to find its way into wine education and winery social media channels. The article is a sound resource for advice on how to use Vine. 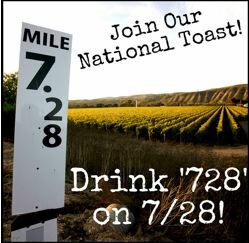 Fiddlestix National Toast July 28 FiddleFans are urged to raise a glass on 7/28 for the 2nd Annual Toast to the signature ‘728’ Pinot Noir from Fiddlestix Vineyard. There are two ways to participate. You can join the “land-based” party at the Fiddlestix Lompoc winery where there will be a tasting of ‘728’ verticals, BBQ beef sliders, ‘728’ deals. Or you can throw your own party with family and friends by purchasing a Party Pack containing ‘728’ Pinot Noir, hats or shirts, logo glasses, recipes and wine notes. ‘728’ swab also available. Visit www.fiddleheadcellars.com. 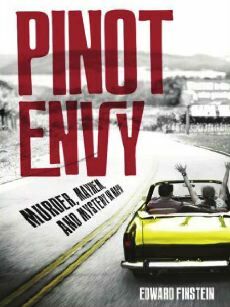 Pinot Envy Edward Finstein, also known as “The Wine Doctor,” and an internationally acclaimed wine expert, has published his first fiction novel, Pinot Envy. The book tells the story of an investigator, Woody Robins, who was hired by a wealthy Napa Valley grape grower to find his stolen, rare and priceless, large bottle of Burgundy that once belonged to the French emperor, Napoleon Bonaparte. Bancroft Press, 199 pages, hardcover ($17.86) or Kindle edition ($9.99). Pinot Noir from the World’s Oldest Winery Brotherhood was established in 1839 and is America’s oldest winery. In 1910, a French Huguenot emigrant, Jean Jaques, acquired land in the Hudson Valley of New York and began planting grapes. By 1837, he needed more land, so he bought another plot in Washingtonville, New York and planted another vineyard. By 1839, underground cellars were dug and Jaques vinified his first vintage. Those cellars, which are the oldest and largest in America, are still in use today at Brotherhood Winery. The Jaques family made wine at the Washintonville facility for almost 60 years, primarily to Jesse and Edward Emerson, two New York City wine merchants who were vintners themselves. When the Emerson family took control of the Washingtonville winery, they renamed it Brotherhood after an organization called The Brotherhood of New Life, an experiment in utopian communal living in the Hudson Valley. Louis Farrell and his family purchased the winery in 1921 and initiated the concept of wine tourism, hosting parties and events at the winery as well as introducing the Brotherhood brand to many American drinkers. Today, the winemakers are Cesar Baeza, who has made wine worldwide, and Bob Barrow, who works closely with Baeza. The winery’s 2010 Pinot Noir (vineyard source not specified) is available at $14.99. Visit www.brotherhoodwinery. com.